One of my most valuable sources of recipe inspiration is local restaurants. In our neighborhood there’s a little place called Black Creek Bistro that makes killer sandwiches for the lunch crowd and elegant, inspired meals for a fancy night out. I’m partial to their Salmon BLT, but the last time I made it to the Bistro for lunch I deviated from my usual and tried their Dave’s Trainwreck Sandwich. The Sandwich is aptly named, as it’s quite a mess. It starts with a grilled chicken breast, but that’s the only thing average about this sandwich. The chicken is then piled high with green beans, grilled onions, gobs of Swiss cheese, and french fries (that’s right! FRENCH FRIES). and smashed between two pieces of sourdough bread. It.is.wonderful. We had some leftover Teriyaki Green Beans last week, and there presence made me recall that delightful mess of a sandwich. I thought about recreating the chicken sandwich as is, but what I really wanted was a burger. What can I say? The baby likes beef, and I’m not about to say no. While I love Black Creek’s Trainwreck sandwiches, I think these burgers might top them. 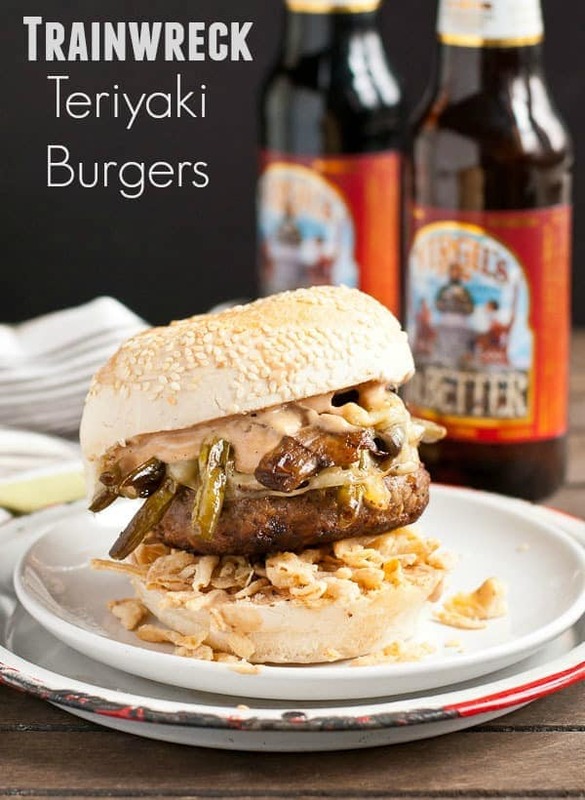 The burger itself is fairly simple–it’s juicy little number enhanced only by garlic, teriyaki sauce, and salt and pepper. The toppings are what really set this sandwich apart. 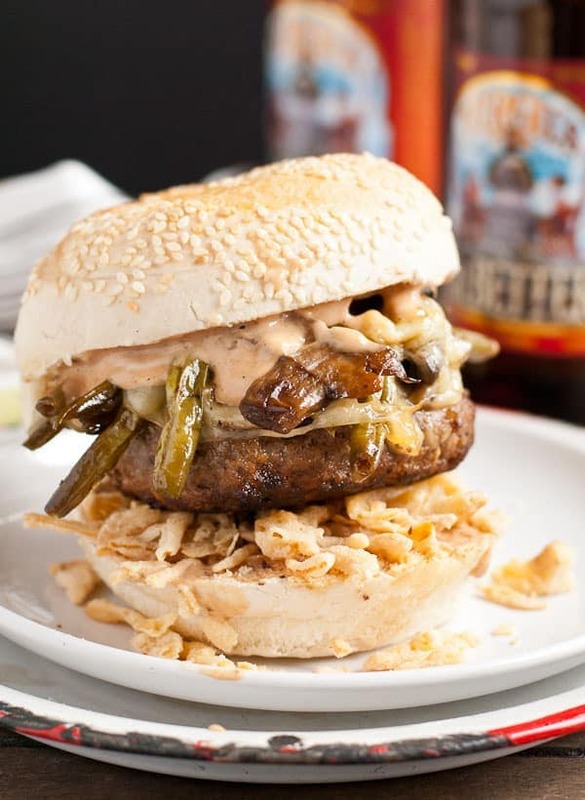 Loaded with teriyaki green beans, mushrooms, french fried onions, and melted Swiss, this burger can only be described as a complete and utter trainwreck. The most delicious, mouthwatering, irresistible trainwreck around. Don’t wait until summer time to whip up these tasty burgers. We find a cast iron skillet gives burgers that perfect slightly crispy char while keeping the inside nice and juicy. I let the Mr. handle the burger cooking and he also likes to add a Tablespoon or two of butter to the pan. I pretend not to notice, and just enjoy it. If you’d rather not use butter, cooking spray works too. Butter or no butter, this sandwich is the perfect way to brighten up a dreary winter day. It’s comfort food between two buns. Line a baking sheet with foil and preheat the oven to 425 degrees. Rinse and dry the green beans then place them, the mushrooms, teriyaki sauce, and olive oil in a gallon sized plastic bag. Seal it up and toss the sauce with the vegetables until everything is well coated. Allow to marinate for about 10 minutes. Spread the mixture out on a baking sheet, sprinkle evenly with salt and pepper, and roast for 20-25 minutes or until beans are crisp-tender and starting to look a little shrively and browned on the edges. In a medium mixing bowl, use your fingers to gently mix together the ground chuck, garlic, teriyaki sauce, salt, and pepper. Gently pat into three burger patties, at least the size of your buns (they'll shrink when cooked). Heat a cast iron skillet over medium high heat. Melt butter in the skillet, then add the patties. Cook for 4-5 minutes per side or until cooked to desired doneness (a little less for medium rare, a little more for well done). Towards the end of the cook time, place cheese slices on burgers and allow them to melt. 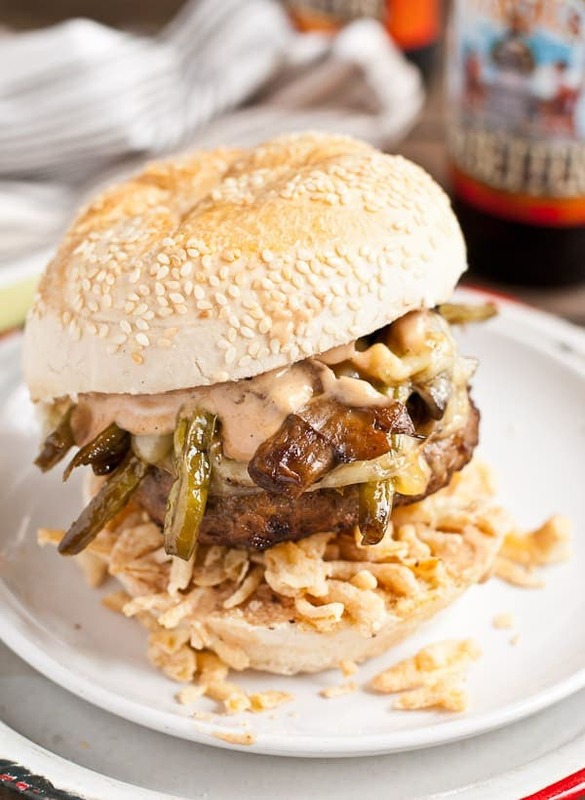 Remove the burgers from the grill and top with green beans, mushrooms, and french fried onions. Serve with a side of mayo mixed with a few teaspoons of teriyaki sauce. This will make many more beans than you need for the burgers. Feel free to halve the recipe, or simply save the leftovers for a side dish for another meal! Looking for more Fantastic Burger Recipes? Try these! This looks like a trainwreck in the BEST possible way!! The messier the burger, the better. This burger is A+. Yummy! Gotta try this with our grass-fed ground beef! Is that what you used? It looks so good! Yep! We used the grass fed beef and it was DE-lish!